PHOENIX, AZ – SEPTEMBER 25, 2013: Jeremy Hammer, owner of Fly-N-Hi Total Performance Center in Phoenix, is proud to announce Nitto Tires as the teams tire of choice. This news comes as the team is anxiously preparing two cars for the Nitto Tires Ultra4 Nationals in Congress, AZ this weekend. “We are proud to have their tire under our car and join the team of champions including Loren Healey, Jason Scherer, Nick Nelson and Randy & Cottin Rodd among others,” said Jeremy as he looked up for a minute from mounting tires. The Ultra4 car is currently getting a new wrap. Fly-N-Hi took second in the 2013 Southwest Dirt Riot series and is sitting 6th in national points, with the final Dirt Riot National Rampage in two weeks. They are the defending series class champion, and current points leader, in the Arizona Desert Racing Association series (ADRA). 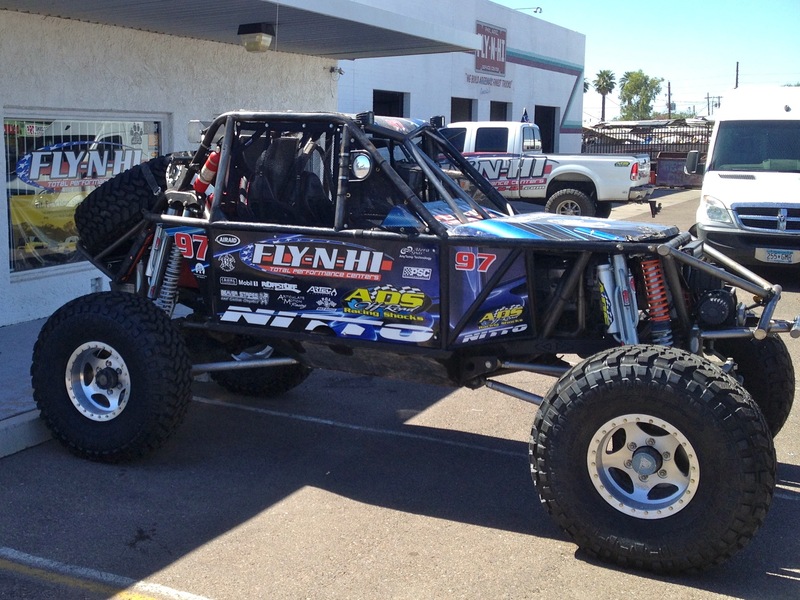 This weekend, the Fly-N-Hi team is counting on a solid finish to qualify for the 2014 Griffin King of the Hammers in February. They will be running two cars, with drivers of record Jeremy Hammer and the second Ken Goodall. They recently hosted the 2013 Vindication King of the Hammers movie premier in Arizona. The Fly-N-Hi Total Performance Centers racing team has been successful with the help from their working partners. Products for, and services from, all their sponsors are available through their store including ADS Shocks, Nitto Tires, Hughes Performance transmissions and converters, Rigid Industries lights, Artec Industries parts, Duffee Motorsports motors, Forced Induction Tuning services, Articulate Motion fabrication work, along with an additional long list of off-road parts. They are located in Phoenix, Arizona. “There is no doubt that the professional relationships that we have with our sponsors allow us to showcase their products at these races and then come back to the shop and help others be successful,” said Jeremy Hammer. “Our shop has 6 work bays for anything from bolt on accessories to custom fabrication, and our 2000 sqft showroom has products that any 4×4 needs with over 9 million in inventory available only a phone call away.” Fly-N-Hi has been in business since 1980, Jeremy Hammer bought it in 2007 and has successfully survived the economic crash. “I bought it at just the right time,” he laughed. “We work hard every day to make sure every 4 wheel drive customer that needs anything gets handled conveniently and fast, it’s what we do! We are a family owned company, not some global corporation or Internet based computer geek. We Love what we do and our one on one customer service is second to none.” Find out more about their race efforts atfacebook.com/FlyNHighTotalPerformance and see their website for more information athttp://www.fly-n-hi.com.